It is time for the monthly Degustabox review! For those of you unfamiliar with the box, here is some information. 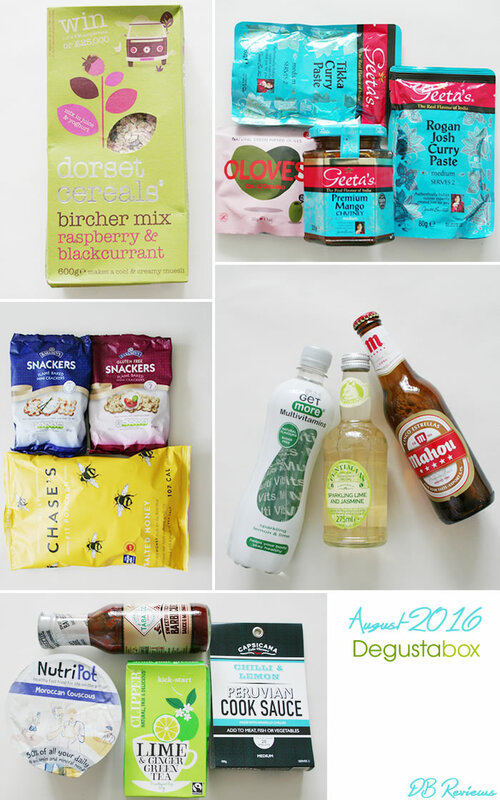 Degustabox are a monthly food subscription box. For £12.99 (including shipping) you receive around 10-15 food and drink products in your surprise box. Many of the products in the box are new launches and so it is always exciting to try them. The August box arrived in the last week of August and contained 16 items (since I was sent the box for review purposes, my box had all of the products that were available for this month's box ). As a subscriber you will get products based on your taste preferences and hence 1 or 2 products shown in this post may not be included in your box. Let me begin with the drinks included in the box. A bottle of Get More Multivitamins Sparkling Lemon and Lime drink which was refreshingly aerated and contained 6 different Vitamins, had no added sugar and was naturally flavoured - a winner for me. Loved the natural taste. Next up was a bottle of Fentimans Sparkling Lime and Jasmine drink which was wonderful. Tasted good on its own. I liked it very much and on a recent shop, I picked up a few more bottles of this soft drink. It works well in cocktails too. And finally we had a bottle of Cinco Estrellas Mahou - a premium Spanish lager that I enjoyed on a hot and sunny afternoon. There were three products from Geeta's. I was happy to see a jar of the Mango chutney as this is something that I always buy. I haven't used the Tikka Curry Paste and Rogan Josh Curry Paste but these will surely come in handy. Nutripots - a brand new to me and something which I was looking to try. We received the Aromatic Thai Noodles and the Moroccan Couscous variant and both were delicious. These instant pots contain 50% of your daily vitamin and mineral needs and are an excellent choice for lunch or snack in the office or when you are travelling. My favourite from the box was Oloves - tasty Olives, freshly packed and low in calories. The Chilli and Oregano flavour was yummy - delicious on its own and would pair well with crackers as well. For breakfast there was a box of Dorset Cereals Bircher Muesli Mix in Raspberry and Blackcurrant - a very healthy way to start the day. Can be enjoyed with plain yoghurt or with a fruity yoghurt topped with fresh fruit. Also in the box was a pack of Clipper Green Tea Lime & Ginger which both myself and Mr.H enjoyed. Rakusen's have been making healthy crackers since 1900 but surprisingly I hadn't heard of them. So these packets of crackers - plain & gluten free - were new to me. I enjoyed the plain crackers but the gluten-free ones not as much because they were quite dry and weak in flavour. Willy Chase’s Fit popcorn (Salted Honey) was lovely - sweet and perfectly balanced with a touch of sea salt. These are available in 4 other flavours and I will be picking up the others on my next shop, especially the Chase Smoky Bloody Mary. The final two products were: Peruvian Chilli & Lemon Cook Sauce from Capsicana and Tabasco's Sweet & Sticky Barbecue Sauce & Marinade. The latter is perfect with burgers. Overall it was another varied and good box from Degustabox.